A tall right-hander, Jay Hughes was the best of the turn-of-the-century pitchers whose major-league careers were disjointed or abbreviated by a preference for playing in their native California. A lifelong Sacramento resident, Hughes was arguably the dominant hurler in the 1899 National League, leading the circuit in victories (28) and winning percentage (.824) while hurling for the league champion Brooklyn Superbas. The following year, Hughes chose to remain home and pitch in the California League. He returned to Brooklyn and posted good numbers in 1901-1902, only to abandon the majors once again and spend the remainder of his playing career on the West Coast. Looking back over time, his exceptional four-season major-league record (83-40, .675) suggests that perhaps only declination to cross the Continental Divide stood between Hughes and an eventual plaque in Cooperstown. Known throughout his life as Jay, James H. Hughes was born in Sacramento on January 22, 1874.1 Family history is sketchy, but genealogical research recently done by baseball historian Bruce Allardice suggests that Jay was most likely the son of laborer-turned-plumber John Edward Joseph Hughes (born about 1847), and his wife, the former Margaret Ann Kehoe (1848-1887), both Irish immigrants. The only identifiable member of his family is older brother Buck (John Edward) Hughes (1869-1908), a prominent California independent club and minor-league ballplayer during the 1890s and a sometimes-teammate of Jay.2 Similarly, nothing is known about the extent of Jay’s schooling. But his literacy suggests that he attained at least some elementary-school education. As a youngster, Jay was something of a neighborhood thug. Several weeks after he reportedly stabbed a local youth named Dawson, Hughes and an accomplice were arrested and jailed for burglarizing the residence of tenants of his grandmother Julia Kehoe. He evidently straightened out and by the time he reached his late teens, Hughes made his living as a saddle maker, and spent his free time on the baseball diamond.3 Like countless others, he began playing in city sandlots and then graduated to local amateur clubs. Then a pitcher-outfielder, Hughes made his professional debut on July 9, 1893, with the Sacramento Senators of the four-team California League.4 As subsequently reported in Sporting Life, “Oakland gave Sacramento a severe drubbing. The home team’s defeat was due to the wildness of Hughes, a young Sacramentan who has been playing in the amateur ranks and in whom his friends thought they had a phenomenon. He did not pan out well, and Oakland had a picnic with him.”5 And how. In eight innings, Oakland reached the youngster for 16 base hits. Hughes also walked 10, threw two wild pitches, and hit a batter. On the plus side, Jay, always a capable hitter, went 3-for-4 at the plate himself. His name then receded from newsprint. During the offseason, the owners of the Baltimore and Brooklyn clubs syndicated their franchises, with Orioles manager/co-owner Hanlon transferring to Brooklyn. The cream of the Baltimore roster, including Jay Hughes, soon followed.16 With the team renamed the Superbas in his honor, Hanlon led the Brooklyn club to an outstanding 101-47 (.682) record and a comfortable 1899 National League pennant.17 In only his second big-league season, Hughes was probably the best pitcher in baseball. His 28 victories tied Baltimore newcomer Joe McGinnity for the NL lead, while his .824 winning percentage was easily the league best. He also placed among league leaders in hits allowed per game (7.71, 2nd), ERA (2.68, 5th), and strikeouts (99, 9th), but registered top-ten in negative categories, as well (119 walks, 6th,, and nine wild pitches, 9th). Notwithstanding the need to improve his control, the soon to be 26-year-old Jay Hughes appeared perched on the cusp of pitching greatness. Sadly, he would not achieve it. Domestic, economic, and geographical priorities quickly supplanted major-league baseball in Hughes’s life. Only 27, Jay was still a fine pitcher, and early in the campaign Brooklyn sportswriter John B. Foster reported that he was “in top form and pitching with the same quizzical smile as before.”28 But he suffered intermittent arm miseries and was no longer the dominator of two seasons earlier. In time, Hughes settled in as third man in the Superbas rotation behind staff leaders Bill Donovan (25-15) and Frank Kitson (19-11).29 In 31 appearances, Jay posted a 17-12 mark, with a 3.27 ERA in 250⅔ innings-pitched, for a third-place (79-57) finisher. Late in the 1901 campaign, Hanlon and club co-owner Charles Ebbets had publicly denied a rumor that Hughes was about to be released,30 but the following spring it was reported, ominously, that “Hughes was not in good shape last year,”31 often sportswriter code language for a player having a drinking problem. 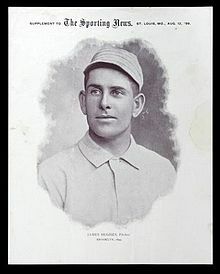 Whatever the situation, Brooklyn re-signed Hughes for the 1902 season, squelching widespread report that the hurler was poised to jump to Baltimore.32 Much like the previous season, Hughes was nagged by injury (this time, a pulled muscle in his side) and still only the club’s number three starter. But he turned in first-rate numbers: 15-10, with a 2.87 ERA in 245 innings pitched for the runner-up (75-63) 1902 Brooklyn Superbas. With 15-game winner Doc Newton bolting the Brooklyn club for the new Pacific Coast League, it seems likely that Hanlon and Ebbets wanted Hughes back for the 1903 campaign. Jay, however, chose to sign with the Seattle entry in the fledgling West Coast circuit,33 bringing his four-season major-league career to a premature end. In 134 games, he had gone a sparkling 83-40 (.675), with a 3.00 ERA in 1,088 innings pitched. Largely without benefit of the foul ball-strike rule,34 his strikeouts total (368) did not quite top his walks (372), but a stingy .245 opponents’ batting average attested to the quality of Hughes’s stuff. With his club sliding into also-ran status, Hanlon tried to lure Hughes back to the Superbas. But as before, salary negotiations between the Brooklyn skipper and the tough-minded hurler proved arduous and ultimately bore no fruit.36 Hughes then returned to Seattle and turned in another standout season: 26-18, with a 2.66 ERA in 389 innings pitched for the middle-of-the pack (115-105) Siwashes. With seven campaigns under his belt, Hughes’s professional record now stood at a gaudy 166-82 (.677). Only 31 and with his arm showing little sign of wearing down, Jay looked as if he could continue on indefinitely. But as it turned out, only one more victory would be added to his résumé. San Francisco had retained a reserve clause hold on Hughes and brought him back for a 1907 tryout. But he was hit liberally in a late-May audition against Oakland, with one printed game account declaring that “the former star didn’t show so much as a flash of the form that made him famous on Eastern diamonds.”44 Soon thereafter, Hughes was unconditionally released by San Francisco.45 At age 33, his professional pitching days were over for good. On June 2, 1924, his landlord gave Jay a ride into town, ostensibly so that he could see a show. Hours later, a passing taxicab driver discovered his cold and lifeless body lying at the bottom of a steep railroad trestle. Jay Hughes was 50. An autopsy revealed that Hughes had suffered a life-ending fractured skull, most likely inflicted by a fall from the trestle. After a brief investigation, police officials pronounced the death accidental rather than the result of foul play or suicide.51 Because no toxicology examination was ordered, the role of alcohol, if any, in the deceased’s fatal mishap could not be determined.52 A once-accomplished but ultimately sad life was closed by interment of the remains of James H. “Jay” Hughes at St. Joseph Cemetery, Sacramento. He was survived by his ex-wife and four children. Sources for the biographical information recited herein include the Hughes player file maintained at the Giamatti Research Center, National Baseball Hall of Fame and Museum, Cooperstown, New York; the bio of Jay Hughes published in Major League Profiles, 1871-1900, Vol. I, David Nemec, ed. (Lincoln: University of Nebraska Press, 2011); US Census data, Sacramento city directory listings, and Hughes family posts accessed via Ancestry.com; and certain of the newspaper articles cited below. Unless otherwise noted, stats have been taken from Baseball-Reference. 1 At the time this bio was submitted, the process of correcting a mistaken birth name (James Jay Hughes) and other errata in the listings for Hughes in Baseball-Reference, Retrosheet, and other modern baseball reference works was ongoing. For more detail on the corrections to the Hughes listings, see Bill Lamb, “Jay Hughes: An Exercise in Biographical Review and Revision,” The Inside Game, SABR Deadball Era Committee, Vol. XVII, No. 3 (June 2017). 2 The specious identification of Jay Hughes as the younger brother of late-1880s major-league pitcher Mickey (Michael J.) Hughes, born in New York City on October 25, 1866, has recently been expunged from SABR records. See Biographical Research Committee Report, January-February 2017, 8. 3 As per the 1893 Sacramento city directory listing for James H. Hughes. The anecdote about Hughes' arrest comes from the Sacramento Record-Union, June 23, 1884. 4 The Sacramento club was a midseason replacement for the drop-out Stockton River Pirates. 5 Sporting Life, July 22, 1893. 6 The California League disbanded at the conclusion of the 1893 season, and Organized Baseball was not played on the West Coast during the next two years. The New Pacific League contract of J. Hughes of Victoria was filed with the NAPBBL, the overseer of minor-league baseball, and noted in Sporting Life, June 15, 1896. 7 Baseball-Reference provides no height for the 180-pound Hughes, but the adjective “tall” was regularly applied to him and club photos suggest that he was at least 6-feet, if not taller. 8 Sacramento Union, June 24, 1897. 9 Per the San Francisco Chronicle, August 29, 1897. 10 Gilt Edge was the name of the prize lager produced by the Sacramento brewery that sponsored Hughes’s club. 11 The box score published in the San Francisco Chronicle, November 28, 1897, identified the Sacramento second baseman-leadoff hitter as E. (for Ed) Hughes, rather than Buck Hughes..
12 As reported in the San Francisco Chronicle, December 4, 1897, and Sporting Life, December 11, 1897. Hughes later gave Jennings a gold locket with diamond as a token of appreciation for Jennings’ assistance in his becoming a major leaguer. See the Washington (DC) Evening Star, October 19, 1898, and Sporting Life, October 29, 1898. 13 As per Sporting Life, March 26, 1898. 14 That same date, Cincinnati Reds left-hander Ted Breitenstein no-hit Pittsburgh, 11-0, making April 22, 1898, the first date in history on which two major-league no-hitters were thrown simultaneously. 15 As reported in the Sacramento Union, December 12, 1898. Buck had been released by the Sacramento Gilt Edge that August and retired from the professional game. 16 Other Baltimore stalwarts transferred to Brooklyn were future Hall of Fame outfielders Willie Keeler and Joe Kelley, first baseman Dan McGann, and pitchers Doc McJames and Al Maul, both 20-game winners in 1897. 17 At the time, Hanlon’s Superbas were a popular acrobatic comedy troupe on the vaudeville circuit, but no relation to the Brooklyn baseball club leader. 18 As later reported in Sporting Life, November 25 and December 23, 1899, and the Cincinnati Post, December 28, 1899. 19 As per an item in the Brooklyn Eagle reprinted in the Philadelphia Inquirer, December 17, 1899, and Kansas City American Citizen, February 6, 1900. 20 As reported in the Cincinnati Post, November 30, 1899, and Cleveland Leader, December 4, 1899. 21 As later noted in Sporting Life, November 11 and December 8, 1900. 22 As reported in the Cleveland Plain Dealer, April 15, 1900, and Sporting Life, April 21, 1900. Hughes had signed for $1,800 in 1898; had held out and gotten a raise in 1899, and was currently holding out for a steep increase in 1900. 23 Shortly thereafter, Hughes confided that, while accommodating Mary’s preference that the newlyweds remain home in Sacramento, the overriding factor in his negotiations with Brooklyn had been money. See Sporting Life, May 12, 1900. See also The Sporting News, April 14, 1900. 24 As per The Encyclopedia of Minor League Baseball, Lloyd Johnson and Miles Wolff, eds. (Durham, North Carolina: Baseball America, Inc., 2nd ed., 1997), 125, and Alan O’Connor, Gold on the Diamond: Sacramento’s Greatest Baseball Players, 1886-1976 (Sacramento: Big Tomato Press, 2007), 47-49. Baseball-Reference has no 1900 season stats for Hughes. 25 Fraternal twins James Jay and Marguerite Hughes were born in Sacramento on November 24, 1900. 26 See e.g., Sporting Life, February 1 and March 10, 1901, and the San Francisco Chronicle, March 2, 1901. 27 As reported in the (Jersey City) Jersey Journal, March 7, 1901, and Sporting Life, March 16, 1901. 28 Sporting Life, May 18, 1901. 29 After a one-season hiatus, Doc McJames had also returned to the Brooklyn fold in 1901, but his performance was hampered by ill health. He managed only a 5-6 record before being released in August. McJames died later that year at age 27. 30 As reported in the New York Daily People, August 10, 1901. 31 See Sporting Life, April 12, 1902. 32 See, e.g., the Boston Herald, Rockford (Illinois) Republic, and San Francisco Chronicle, April 9, 1902. 33 As reported in San Francisco Chronicle, April 16, 1903. 34 The foul-strike rule was adopted by the National League in 1901, and by the American the following season. 35 Hughes, Newton, and Corbett all remained on the Brooklyn reserve list but as the PCL was not a signatory to the National Agreement, the only thing that Hanlon could do was complain bitterly during the major-minor league conference that September. See Sporting Life, November 13, 1903. Then to add to the disgruntled Hanlon’s troubles, Henry Schmidt, the diminutive Hughes-Newton replacement who had won 23 games for Brooklyn that season as a rookie, signed a three-year contract with Oakland shortly thereafter and never pitched in another major-league game. 36 As reported in Sporting Life, November 25, 1903, the Wilkes-Barre (Pennsylvania) Times, November 30, 1903, and Sault Ste. Marie (Michigan) Evening News, December 3, 1903. The following spring, Brooklyn waived all claim to Hughes, Newton, and Schmidt pursuant to an agreement reached by the National League, American League, the NAPBBL, and the Pacific Coast League. See the Seattle Times, March 22, 1904, and Sporting Life, March 26, 1904. 37 As explicated in the Seattle Times, January 24, March 23, and May 15 and 22, 1905. 38 See the Seattle Times, June 15, 1905. 39 As per the Seattle Times, July 1, 1905. 40 The Pacific Coast League’s entry into Organized Baseball in late 1903 had required its recognition of the reserve clause. 41 As reported in the Seattle Times, February 4, 1906, Sacramento Union, February 6, 1906, and Cleveland Leader, February 25, 1906. 42 See the Seattle Times, April 18, 1906. 43 As per the Sacramento Union, August 10, 1906. A photo of Hughes in his Cordovas uniform was published in the San Jose Morning News, July 15, 1906. 44 San Francisco Chronicle, May 24, 1907. 45 As per the Sacramento Union, May 26, 1907, and Anaconda (Montana) Standard, June 11, 1907. 46 John Edward (Buck) Hughes died of stomach cancer at age 38. See the Vallejo (California) Times, August 21, 1908, Sacramento Union, August 22, 1908, and Santa Rosa (California) Press Democrat, August 26, 1908. 47 The twins were joined by Marjorie (born 1909) and John Edward (1912, and named for Jay’s late brother). 48 As reported in the Sacramento Union, February 16, 1915. 49 See, e.g., the San Francisco Chronicle, March 1, 1920, and January 14, 1923. When word of his father’s death reached him in June 1924, Jay Jr. did not even remove himself from that day’s lineup for the Evansville Little Evas of the Class B Triple-I League. Nor did he attend his father’s funeral. See the Evansville (Indiana) Courier, June 4, 1924. Some 15 years later, Jay Jr., despondent over marital and financial failures of his own, committed suicide. 50 As per the 1920 US Census. 51 As per the Sacramento Bee, San Jose Evening Times, and Seattle Times, June 2, 1924, and Los Angeles Times, June 3, 1924. 52 For more on Hughes likely suffering the death of a drinking man, see Carlos Bauer, “Thinking About Jay Hughes,” http://minorleagueblogspot.com/2005__11__01archiveland.html., posted September 9, 2005.